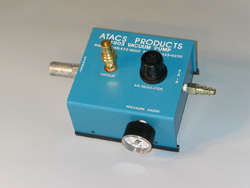 Atacs 4903: VACUUM TRANSDUCER ASSEMBLY « Atacs Products Inc. This is a small, lightweight,compact and portable vacuum transducer designed for application in aircraft repair facilities as an alternative to expensive central systems. the unit can be used in conjunction with our Hot Bonder for large area repairs or as a stand alone unit for wet lay-up repairs.